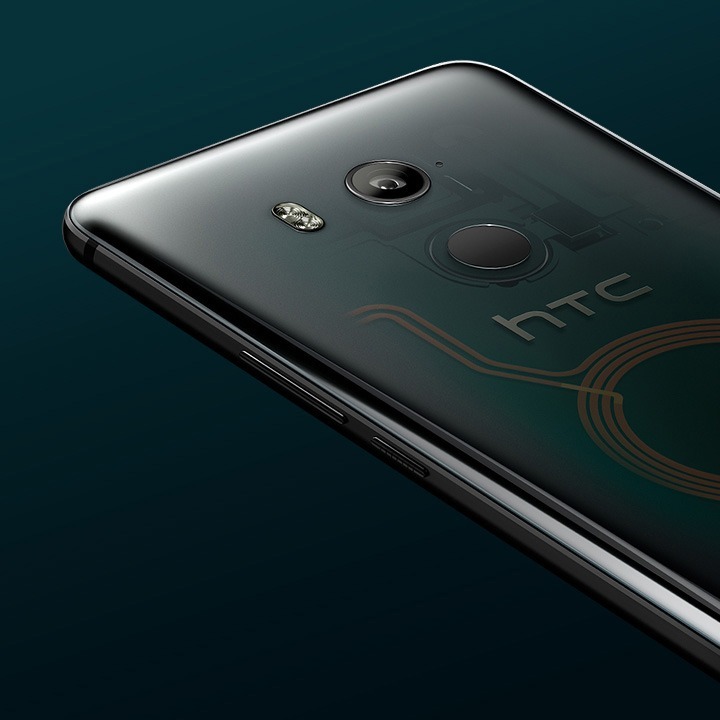 As expected, HTC has unveiled its latest high-end flagship smartphone named the HTC U11+ today which is a slightly upgraded version of the HTC U11. Some of the upgrades include a bigger display with 18:9 aspect ratio and 30% bigger battery as compared to the U11. Along with this U11+, the company also introduced the HTC U11 Life which is a mid-range smartphone that is going to compete with phones like the Moto X4, Nokia 7, etc. Anyways, in this article, we are going to talk about the U11+. Let’s talk about the design and the specifications of the device. If you have seen the HTC U11, then the U11+ is not different regarding the looks since it has the same design from the rear with the Glass back, single rear camera and LED Flash on the left of the camera sensor. One thing that you will notice is the rear-facing fingerprint scanner, and this is because there is an 18:9 display on the front. It would’ve been great to see dual front-firing speakers on the front, but there is nothing on the lower chin. Nevertheless, there is HTC BoomSound™ Hi-Fi edition, so the audio output is surely going to be amazing. Along with this, there are a total of four microphones for the 3D Audio and Acoustic Focus. HTC Usonic with Active Noise Cancellation is another audio feature of the device. The volume rockers are present on the right along with the power button. The SIM and microSD card slot is present on the top. On the bottom, there is the USB Type-C port along with speaker grill and one of the four microphones. Now coming to the specifications, the HTC U11+ features a 6-inch Quad-HD display with an aspect ratio of 18:9 and Corning Gorilla Glass 5 protection. Snapdragon 835 processor powers the phone with the Adreno 540 GPU. There is 6GB of RAM and 128GB internal storage. There is just one storage variant, and the storage can be further expanded via microSD card up to 2TB. Android 8.0 Oreo runs out of the box with HTC Sense UI and a lot of UI features. The phone is also IP68 dust and water resistant. On the front, there is an 8MP camera with an 85-degree field of view and f/2.0 aperture. There is almost every sensor on the phone including the Ambient light sensor, Proximity sensor, Motion G-sensor, Compass sensor, Gyro sensor, Magnetic sensor, Fingerprint sensor and Edge Sensor. EDGE LAUNCHER – A squeeze opens the Edge Launcher customized for easy and fast access to your favorite apps, contacts, and quick settings. ASSIGN ANY APP – Edge Sense now works within most apps in the Google Play Store. Choose an app and assign a squeeze to perform a tap or double tap. Do things like zoom in on a map or play and pause music. GOOGLE ASSISTANT AND AMAZON ALEXA – Both the Google Assistant and Amazon Alexa are integrated into the software that can be accessed via the Edge Sense also. Starting from November 20th, the Unlocked HTC U11+ with 6GB RAM and 128GB ROM will be available for £699 in the UK. The pricing for Europe is, as expected, higher as the phone will cost €799. There is not much information about the pricing for other markets yet. So, do you think this is the phone from HTC that can compete with the best high-end devices available right now? Do let us know your opinions about the HTC U11+ via the comments section.